Black Magic Muscle Tan was created specifically for the body building industry and allows competitors to obtain as dark a tan as needed without fear of over development. 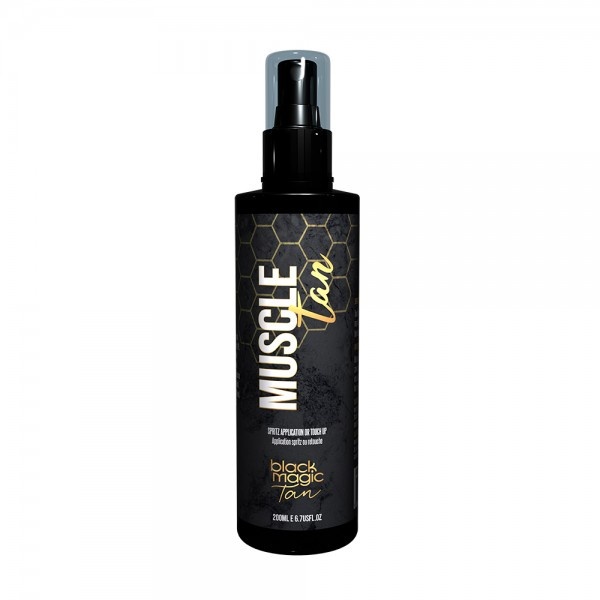 Black Magic Muscle Tan is designed to deliver competitors a lustrous, deep, very dark tan, that enhances muscle definition and body contours for the ultimate presentation on stage. Black Magic Muscle Tan keeps developing over 8 hours and will last between 5 - 7 days or pared back post competition to reveal a natural looking tan. Spritz Muscle Tan onto the application glove, then using a circular motion apply evenly. Apply 1-2 coats of Muscle Tan, dry well between coats. Spritz onto the tanning glove or blending brush and pat/blend areas that require touching up, allow to dry before reapplying. Black Magic Muscle Tan contains ingredients that are beneficial and gentle on the skin. The following list provides an overview of the key active ingredients found in Muscle Tan. An incredibly strong antioxidant Grape seed oil is about 50 times stronger than antioxidants like, vitamin C and E and can also provide protection against sun damage. The linoleic acid found in grape seed oil can be very beneficial in skin conditions like, acne, dermatitis and eczema. Linoleic acid can soothe and nourish the skin, and help it to repair. • Improves the skin texture and the moisture content in the skin. Sunflower Oil retains moisture, and in preventing the skin from drying out it helps to keep wrinkles at bay and the skin looking youthful and vibrantly healthy. It is extremely powerful at keeping away bacteria and maintaining youthful skin. Sunflower seed oil contains a rich mixture of vitamins and other natural substances that have a healthy effect on your skin and its pores.